Thanks to Matt at Radio, Rhythm & Rhyme for hosting the Poetry Friday Roundup today. If you’d like to know more about Poetry Friday, click HERE for an explanation by Renee LaTulippe. Since Landon and I started this series in the fall of 2014, today’s post begins our third year of collaborations! Hope you enjoy! I absolutely love how Landon’s school bus is a crayon box! Along with being a talented artist, he’s super creative! Your poem is adorable, and this is one of Landon’s finest works!! Thanks! And I agree. The crayon box bus is super fine! Love the crayon bus, and the not-quite-big smiles on their faces, clearing showing the worry. 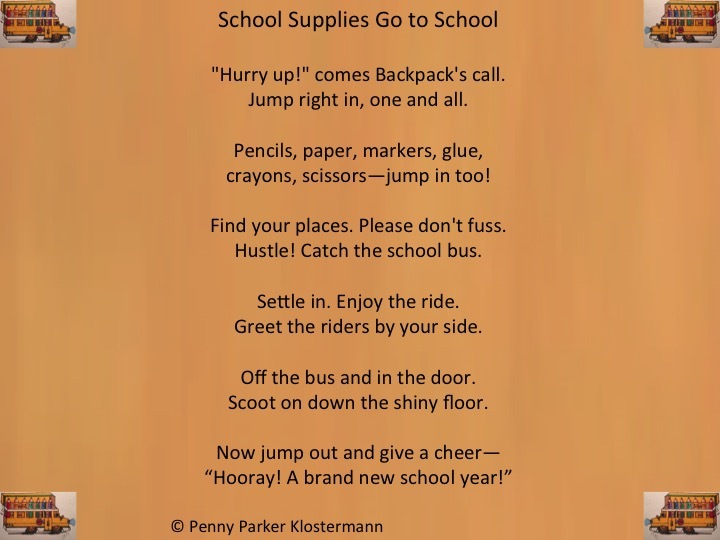 Luckily, the school supplies have no worries, as your poem celebrates. I used to love getting new supplies, and looking around to see who I knew in my new classes. I love this uplifting poem of yours Penny and the beautiful artwork by Landon, a truly budding artist, it’s terrific! 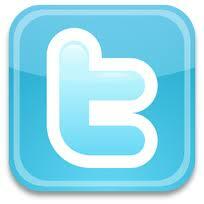 Happy Third anniversary and thanks for all here! This poem and crayon bus makes me want to hop on and go back to school. Nice job!! Me too! Who wouldn’t want to ride on that bus??? Thanks for coming by Nana Janna! Love seeing you and Landon back, Penny, that you included those “shiny floors” in your poem. That is an image that sticks with me about September and school opening. Landon’s art is perfect, is a wonderful image that teachers would love to have for their classrooms! Time for a reprinting! The “shiny floors” stuck with me too, Linda. I saw my share of them over the 26 years I spent teaching, plus all of my years as a student. Wouldn’t teachers love that crayon bus?? It’s very creative. Thanks so much for coming by. Landon is so talented, and so creative! Congrats to three great years! Hooray for the dynamic duo to create a school bus theme-related image poem. Backpack is the star cheerleader in this poem and Landon the clever, creative illustrator. Penny, I am glad that you opened the school year with this poem and hope other children will be inspired by Landon. Thanks, Carol. I spent quite a bit of time thinking about a “beginning of school” poem. When I thought about how much fun new school supplies are, words starting falling into place. Glad you enjoyed our collaboration. What a fun poem and Landon’s illustration is awesome. I love the crayon box school bus. It makes me wish I were starting school this year! Landon has a future in illustration – that’s terrific! And your poem is the perfect pairing. Nice to see you two are still at it! Thanks, Matt. I think Landon has the knack. He adds to the words which is what a good illustrator needs to do! Thanks for hosting today and congrats on ALL your wonderful news!! Cute poem. That illustration is just oo much fun. Thanks for the post. Thanks, Rosi! I was thrilled as usual when Landon sent his art! Delightful! Definitely a fun two-fer today! Thanks, Sandy. I really loved this collaboration! I think all school buses should be crayon boxes. There’s nothing I don’t love about that idea. And also, all backpacks should talk to the supplies inside! Cupcake…you are one smart dog and I love the way you think! Such a fun and clever poem. But, I really love that Landon’s awesome school bus is a crayon box. Me too, Pat. 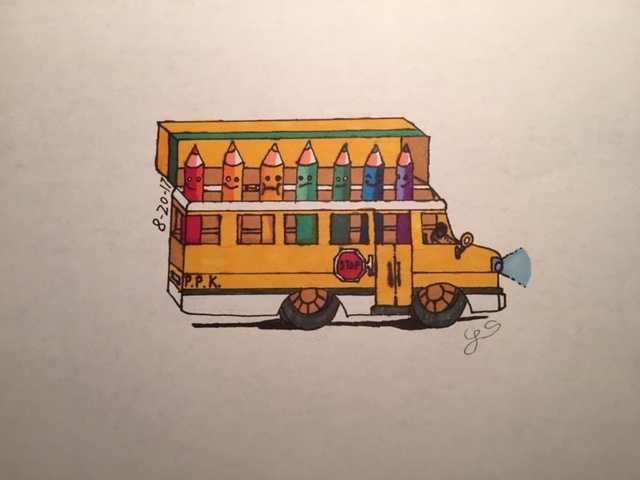 The crayon box school bus is the BEST! So much emotion on Landon’s crayon-kids! Glad to see the dynamic duo back again. Thanks, Buffy! Their expressions were a nice detail! Shows Landon’s artistry and creativity. Happy 3rd year anniversary! Love this series.